The roofing structures for our Garden RoomsE and Garden Offices are substantially built, and engineered to allow for snow loadings and maintenance where necessary. 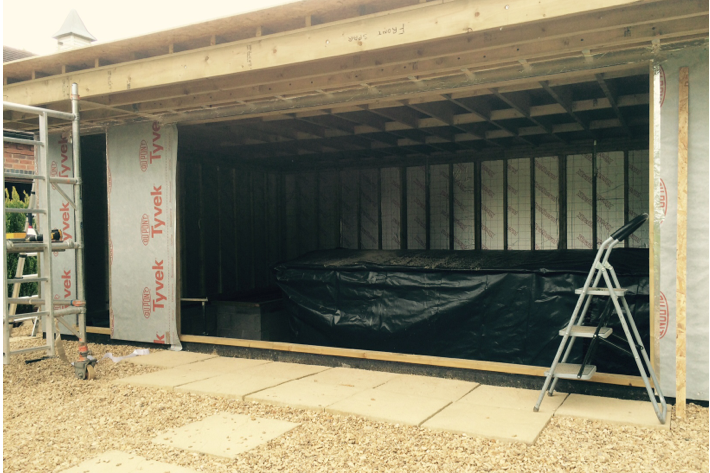 Some companies offer slightly more interior headroom (ours are 6'9") by reducing the roof and floor timber sizes to stay within the 2.5m Planning Restrictions, which we regard as a risky practice. In days gone by, flat roofing (it's not totally flat as it has a slope on it towards the rear gutters) had a bad reputation, but not anymore. New technologies introduced to the UK market, particularly over the past 10 years or so, have effectively put an end to leaking flat roofs. 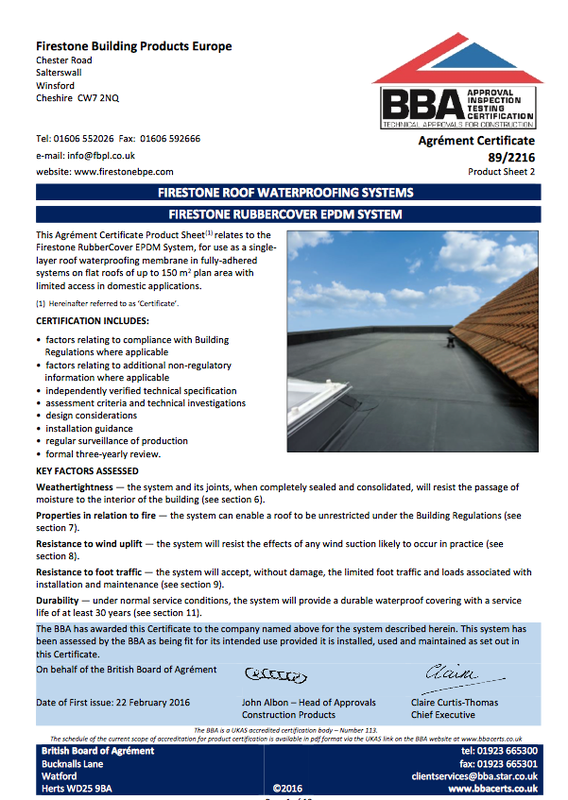 With a number of options now available, we chose the Firestone EPDM Rubber solution as it is backed by an internationally recognised brand with a solid 20 year guarantee. Since 1980, more than 1,000,000,000 m² of Firestone EPDM membranes have been successfully installed on commercial, industrial and residential roofs worldwide. This product is similar to a rubber pond liner, which of course is more than accustomed to the continuous effects of water! Consequently, all our flat roof models are now fitted with this system which has an expected design life in excess of 30 years. Fitted in one single sheet without joins, the EPDM material can be walked on for general periodic maintenance and can take roof pavers for heavier duty activity or gravel to aid water evaporation. No maintenance is normally required, although an annual visual inspection is recommended. With regards to colour - the material is only available in black but is highly UV stable. It also comes with a full 20 year guarantee when fitted by our Approved Installers and a BBA Certified life expectancy in excess of 30 years. The use of an insulated metal panel system requires a sloping external roof line, which results in a sloping ceiling on the inside of the building. Again, this is a problem if you wish to remain within the 2.5m maximum overall height for compliance with Planning rules under Permitted Development. The inner metal lining panel of the system is too thin and weak to support a plasterboard ceiling attached to it. There is a serious risk of the inner metal skin detaching from the foam core under the weight of the plasterboard and skim finish. This means that fitting a plasterboard ceiling is not a practical option without the risk of damage to the roof panel, which in turn will adversely affect its load bearing capacity. Ceiling spotlights cannot be concealed within the roof panel without a serious risk of over-heating and subsequent fire. Only spotlights on a track type system can be fitted, causing further problems with available headroom. These roofing panels are not very good for soundproofing - if you've ever been inside a factory building when it rains you will know how noisy it is, which is similar to the sound of heavy rain on your Conservatory roof. If the overall height of your Garden Room is not such a problem, and you are happy to apply for formal Planning consent to breach the overall 2.5m height limitation, then some of these issues may not be such a problem, but you should still take caution to understand the limitations and implications of specifying this type of metal roof system.